Riftia pachyptila, the giant vestimentiferan tubeworm from the East Pacific Rise, harbors abundant chemolithoautotrophic, sulfide-oxidizing bacteria in an internal organ, the trophosome. 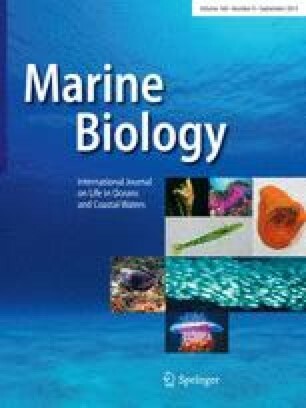 Several facts, such as the lack of a digestive system in the host, stable carbon isotope values and net carbon dioxide uptake all suggest that the tubeworms obtain the bulk of their nutrition from their symbionts. Using tissue autoradiography, we investigated the mode of nutritional transfer between symbionts and host, and the site of early incorporation of symbiont fixed-carbon in the host. Fast labeling in the trophosome clearly demonstrates that the symbionts are the primary site of carbon fixation. Appearance of label in some symbiont-free host tissues in as little as 15 min indicates that the symbionts release a significant amount of organic carbon immediately after fixation. The organic carbon is largely incorporated into specific, metabolically active host tissues such as fast-growing body regions in the trunk and plume, and into tube-secreting glands. In addition to immediate release of fixed carbon by the symbionts, there is evidence of a second possible nutritional mode, digestion of the symbionts, which is consistent with previous suggestions based on trophosome ultrastructure. Results suggest that symbiont-containing host cells migrate in a predictable pattern within trophosome lobules and that symbiont division occurs predominately in the center of a lobule, followed eventually by autolysis/digestion at the periphery of the lobule.